girly for a change. Think I just might do more. look very full and with effort since the vector looks so epic. Started with the sand - Yes it's sand their walking on. dark strokes and light strokes you see on the sand to give depth. and that took care of it. screen you see with the "Reborn" title on it. As for the buildings...ugh they were a pain to make even though they were shapes, I added detail with the advice and help of Maple again. She really helped me with them, guiding me on how to shade and such, after I was done making the shades and such I added lights to some and also wires and such. she was working on walling this however I thought I would surprise her with my own version of it. I saw the basic colors she used and got an idea off them. who suggested I add more text to it. More Resolutions and PNG at: EDD! Browse Katekyo Hitman Reborn! Gallery: Recent | Popular. couldnt resist commenting. look at the badassnessss of this wall zomg! I love everything about this wall. No doubt about that. This is going on my desktop so I can fangirl. they all so cool! fantastic wall! It reminds me of Reservoir Dogs. I like it. w00t! Finally a Reborn! wallie for my desktop! Thanks so much and great job! I like the feeling of depth you get from the city being all blurry, and the sky as well, the little birds in the background and all the attention to detail :). And they look so high and mighty as well, the title fits. Omg *-* I am SO GLAD to see this vectored. <33 It's AMAZING. WOW so cool and the colors are so perfect! It's really awesome wallpaper. thanks for share this picture. 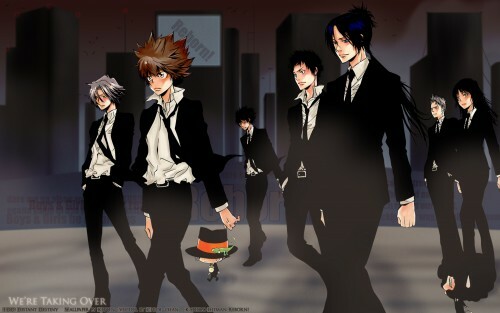 Aww man I'm fangirling -___-'' after I saw Tsuna in his hyoperwhatever mode I've been like I GOtta do a wall with this. Love the wall and the badass look, also, looks good on my screen XD I'm gonna keep it since I like dark colors. Sorry I didn't comment much on the wall. Plus, the title fits like a glove.